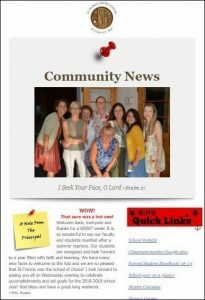 Each Friday a newsletter highlighting the upcoming events is sent to our families. The letters are sent via email, but can also be viewed here as well. Parents, please be sure to contact the school office with any email address changes to ensure that you receive all school related announcements throughout the year. If you unsubscribed to SFX mailings and no longer are receiving newsletters, you may re-subscribe by clicking here.